oh Brandon Sanderson.....you magnificent little bugger you. 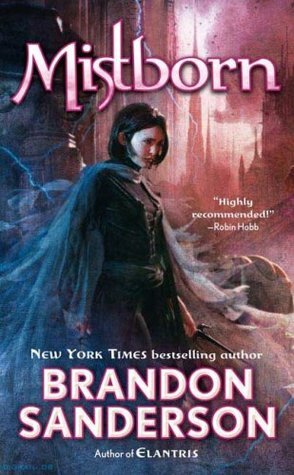 I cannot say enough about Mistborn, it was simply awesome. As a consistent reader in the sci fi / fantasy novel genre, I truly thought I had seen most of the magic systems and variations that different authors use. However, Sanderson introduced the most unique and intricate magic system I have yet to see. That alone was enough to draw me in. But the whole novel, the characters, the plot, the magic, the lore, it was too much to handle. I honestly am full of adrenaline after finishing this novel. The last quarter of this book, more specifically the last two chapters are just unbelievable. When I thought that Sanderson was getting ready to draw things to a close, boom, plot twist....right to the very end. Novels like this one are why I read, and why I continue to love this aspect of my life. Sanderson has easily broken into the upper echelon of authors I enjoy, and I recommend this book to anyone and everyone. Thrill ride from page one and it never ends, you become part of the characters lives, and Sanderson was able to allow me to escape reality for just a little while. In the end, the essence into why fantasy novels continue to dominate my book shelf.